This new feature highlights the programmes we offer which are best suited to you. We have a wide range of programmes specific to the needs of the sports industry. There are programmes for everyone, from athletes to take them from high school, university, post-graduate study and beyond to managers looking to develop specific skills that will give them the edge. Our athlete, management and technical education programmes have their own headings, giving you another way to find what you need. It has never been easier to find the right programme with the WAoS and register to take the next step no matter what your sporting goals are. The WAoS has many partners across a broad spectrum of sport and education throughout the world. Our partners section consolidates all that information into a new, simple format. Our International Sport Federation partners also have updated and improved sites which provide sport specific programmes across the each programme portfolio. If you are interested in being a partner of the WAoS then get in contact with us to discuss. A key focus of the WAoS is in establishing education pathways for competitive athletes that take into account the intense travel, training and competition commitments they have in their sport. 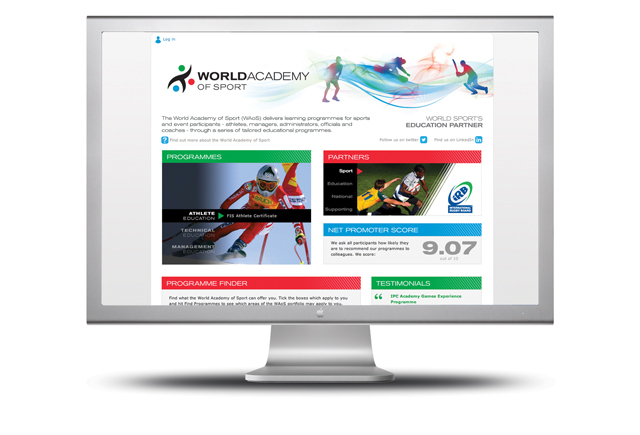 The new site provides our online FIS Athlete Certificate and information on our IB pilot project to make it easy for athletes to find an education programme that’s right for them. In the coming months we’ll update this area as further programmes are announced. The new site has a bigger focus on our social media presence, with easily accessible links to our Twitter and LinkedIn pages. We would love to hear from you and also let you follow everything going on at the WAoS. If you’re uncertain about registering on a programme, take a look at our up-to-date testimonials and net promoter score on the home page to see what other people think of us. The feedback speaks for itself! Spend those five minutes of thinking time today to explore the new site and let us know what you think. We are proud to be able to bring you this new consolidated site and would love to hear your feedback. You may just find that there is a perfect programme that we offer which you can sign up for on the spot.